Well the last three days have been the most busy, tiring, and exciting of the whole trip here in Western Australia. Once the antenna arrived late Wednesday afternoon, we had a lot to do to get the whole system up and running. On Thursday morning, we woke up before the sunrise to get breakfast and were on our way to the site just after 6am. 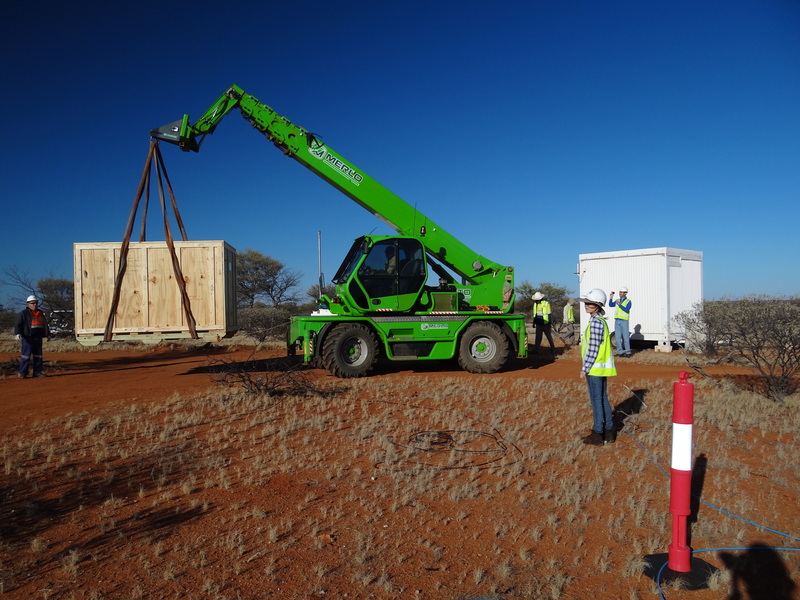 When we arrived, the huge crate that held the antenna and all the other parts to put it together was sitting at the CSIRO site office. Hamdi was quite antsy to get the box to the hut and crack it open. The very kind and efficient staff here at MRO used a crane to drive it the mile from the entrance to the hut for us. Once it was there, we read the directions on how to get the crate open. The antenna and the beautiful weather. After fiddling for about an hour with all the screws that needed to be removed to get the weather shield with the antenna out of the case, we were finally able to pull it out of the crate and set it safely on the ground. 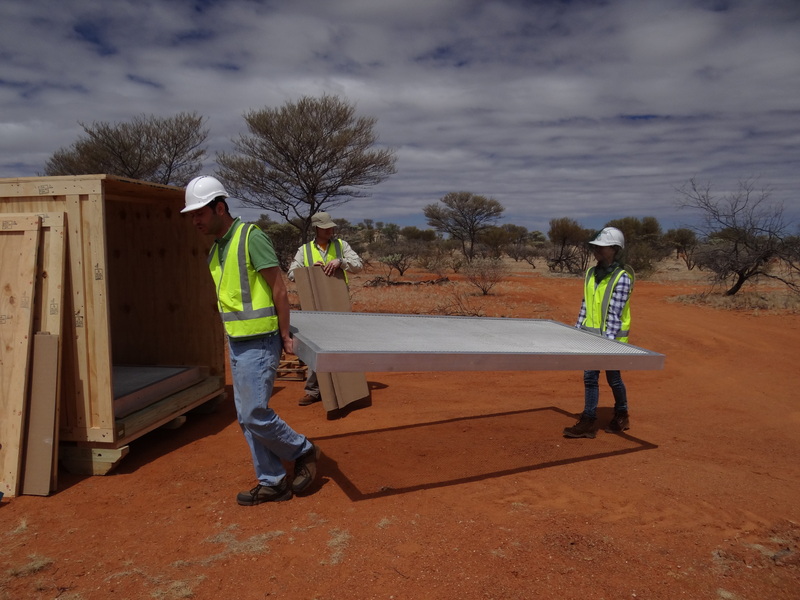 As you can see in the pictures, there are four very large ground screens that we had to unload and carry about 150 feet to the place where the antenna is going to sit while it gathers data. We ran into the issue of how to get it all bolted together when you had to bolt from the underside but there were no legs to have space to get underneath it. We decided that the best way to do it was to bolt it all together upside down and then flip it over. One panel of the ground screen. Judd and Hamdi putting the ground screen together. By the time we had it all bolted together it was time to leave the site because it was getting dark. People are not allowed to work past sunset because of all the wild animals that are on the roads when driving in the dark. So, we headed back to the homestead and had dinner. Last night was a beautiful night to look at all the stars because there were no clouds to be seen. 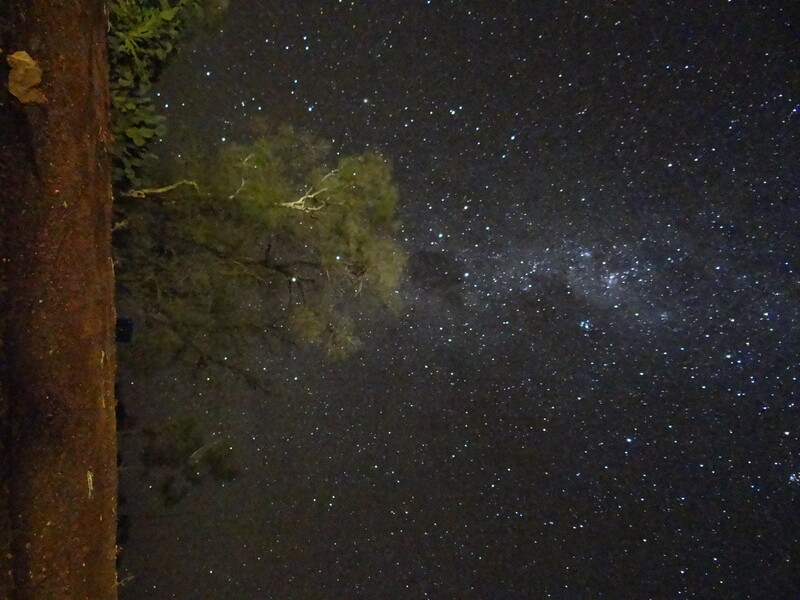 Even though we were completely exhausted from the long day of work, we set out down the drive way of the homestead to get a better view of all the stars. It was absolutely spectacular to see so many stars! 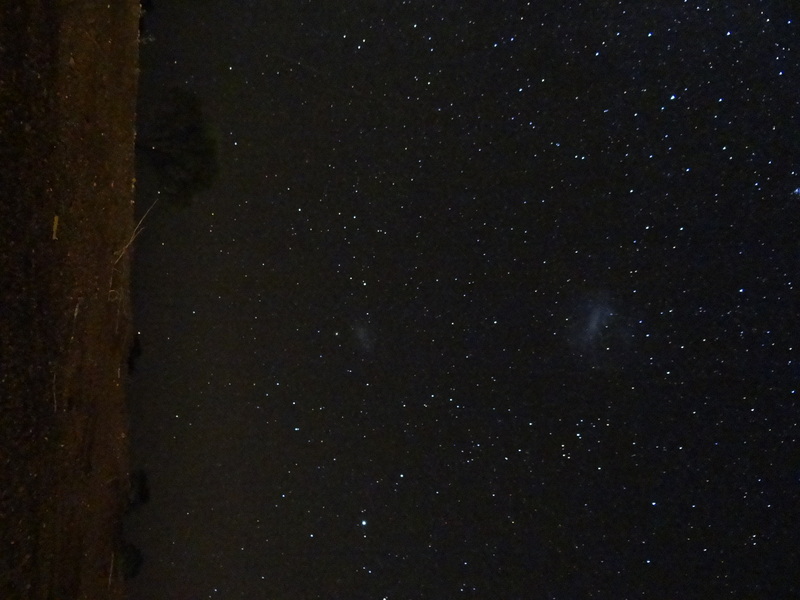 We were even able to see the Magellanic Clouds. According to NASA, “The Magellanic Clouds are irregular dwarf galaxies orbiting our Milky Way galaxy”. To read more about these galaxies, go to http://heasarc.nasa.gov/docs/cosmic/nearest_galaxy_info.html. 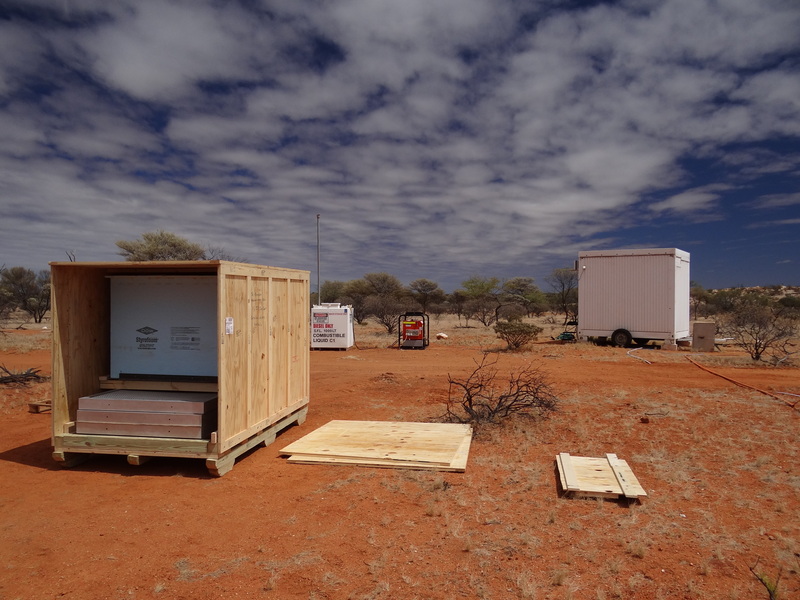 This morning we also woke up before sunrise and were out the site just after 6am, and more excited than yesterday (If you know Hamdi, that excitement was very hard to beat) because of the anticipation of seeing first light with our antenna here in Australia. We started by flipping the ground screen and feeding the power and signal cables though the hole in the center. Once this was done, we put the base of the Styrofoam stand on the ground screen. The ground screen and antenna base. Back in the hut, before we could progress further on the set up of the antenna, we plugged all the power supplies in and tested them with each of the electronic components to make sure the right voltages and currents were being drawn. Once this was verified, we set out into the wind to complete the setting up process. The balun, which transfers the signal from the antenna to the receiver though a coaxial cable (just like a TV cable), was carefully hooked into the antenna and, with a lot of balance and patience, the antenna was finally safely standing here in the Outback. We headed back to the hut to power everything up and check to make sure the antenna was working. To all of our great joy, first light was achieved! Now all that is left to do is make sure that we can control the whole system remotely with no kinks or disasters. Once this is complete, we will have done everything that we came here to do 100 percent successfully! Looking at the antenna spectra. These are the quotes from the last few days! Today was a day of working in our temporary “lab” at the homestead. We are waiting for the antenna to arrive from Geraldton tomorrow afternoon, so today was filled with the final preparations. 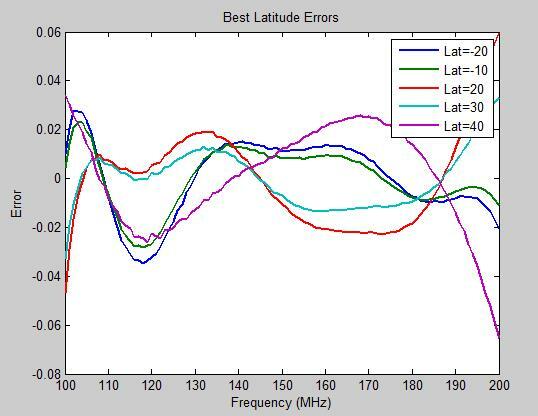 Judd wrote software code that will help evaluate the receiver noise of the instrument using a drift scan. 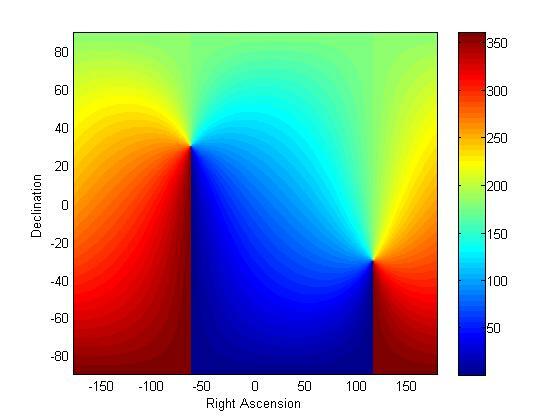 This requires a model of both the radio sky and the beam pattern of the antenna for each frequency that we will observe. 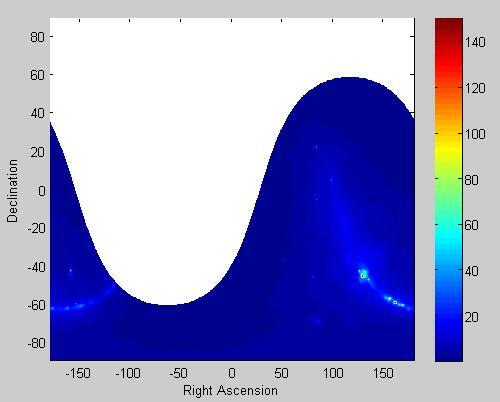 By comparing the predicted (modeled) response of the instrument to the actual observations (once we set up the system! 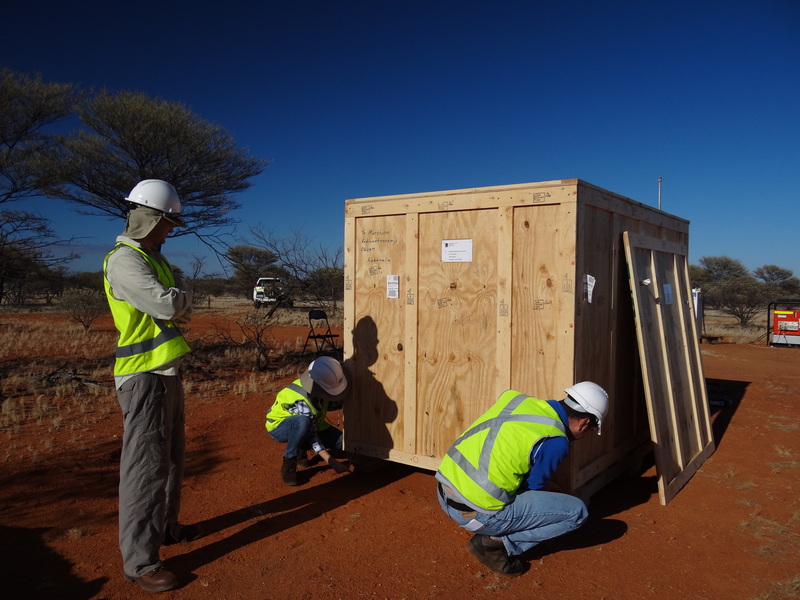 ), we will be able to infer the properties of the receiver, like its noise temperature and gain, and then compare them to the lab measurements that were made by Dr. Bradley at NRAO before the instrument was shipped to Australia. 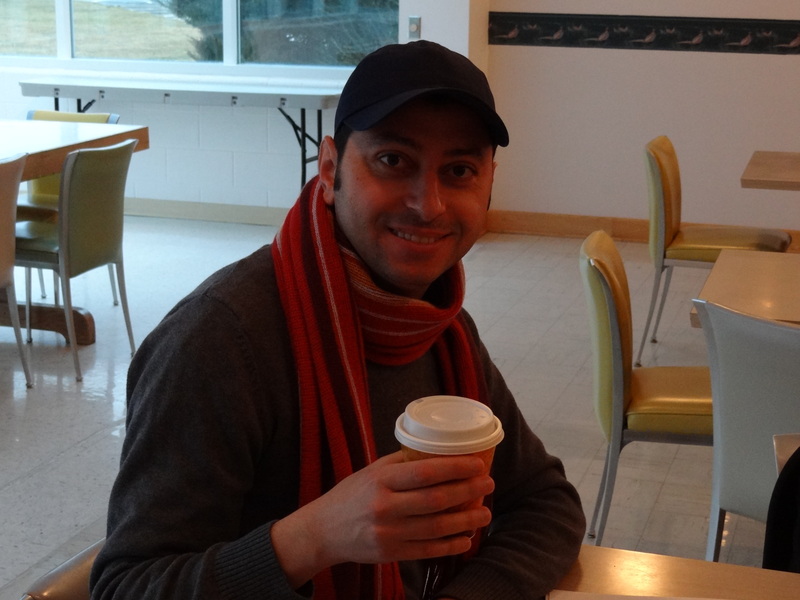 While Judd was working on the code, Hamdi and I were putting the final tweaks on our project. In the United States, a common plug in the wall delivers 110 AC voltage, but in Australia the voltage output is 220 AC voltage. The transformer used for the power supply was intended to take the input of 220 AC voltage, but it was not performing as it was supposed to. Thus, Hamdi, Judd, and I put our heads together on how to bypass this problem. I will update you tomorrow on the progress of our engineering design alterations. Yesterday was a very successful day out here in Australia! 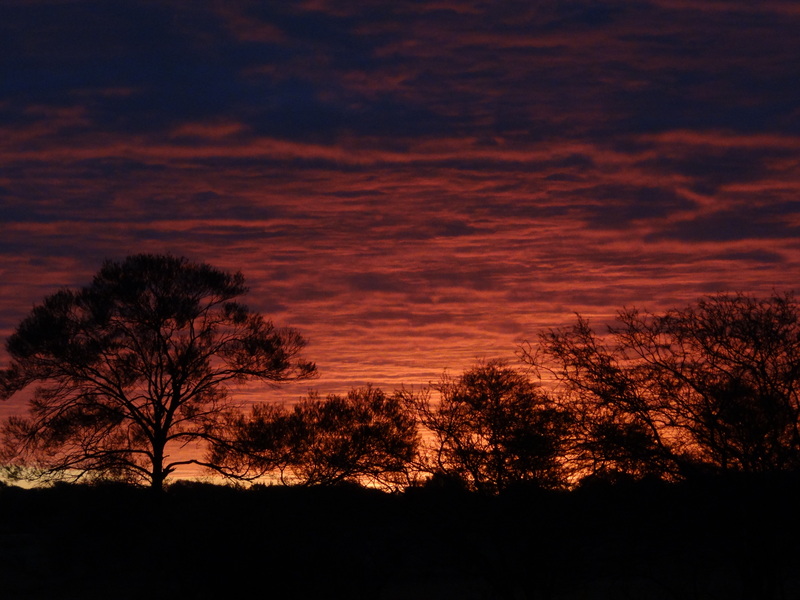 We started the morning bright and early here at the homestead. Judd made all the calls to get the DARE receiver through customs and on express delivery here to the site. We are expecting the receiver on Wednesday. While Judd was getting this all worked out, I worked on my power supply with Hamdi. We finally got all of the outputs connected to the BNC connectors on the front panel. For those who do not know, the BNC connectors are the small circular pieces with the gold metal circle on the inside in the pictures and what they do is make it easy to connect a cable to get the voltage at that output to deliver it to whatever device requires that voltage to run. Pink fan to encourage women in Engineering according to Hamdi. 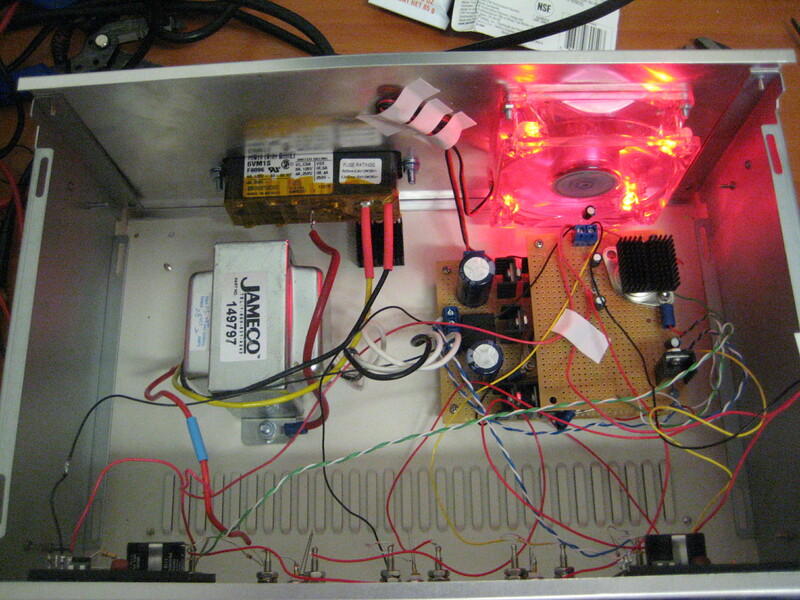 This power supply is unique to the DARE system’s need. DARE needs 3 different voltages to power the whole antenna: 15 volts to power the analog receiver, 5 volts for the frequency synthesizer, and -5 volts for the switch. All of them are clearly marked and measurable. The two channels with the screens are variable voltages, one positive and one negative, that vary in magnitude from approximately 1.2 volts to 13.4 volts. We had everything except the screens and LED’s connected and working before lunch. 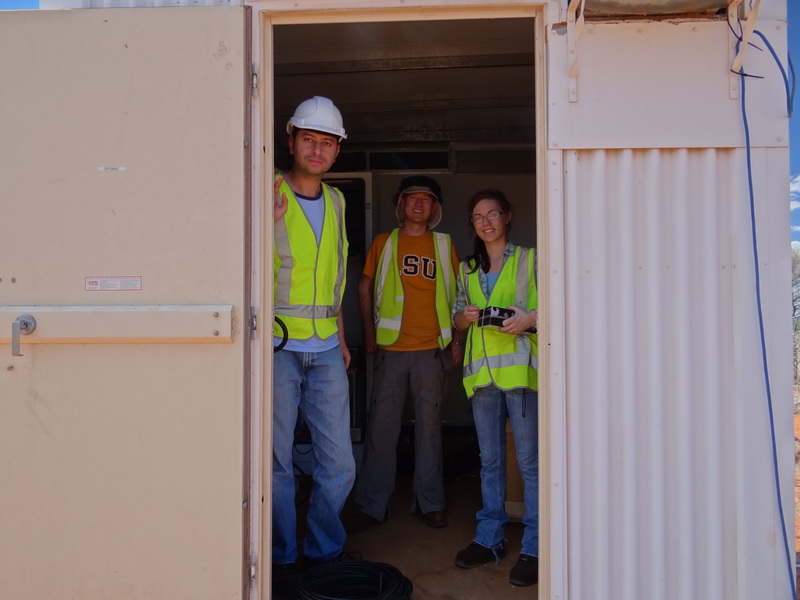 After lunch, we changed into the proper construction site attire, packed up all of our tools, and headed out to the site in the MRO. Circuit board for the power supply. Because we are working on a construction site, we are required to wear hard hats, steel toe boots, reflective vests, and long pants.There is also an abundance of flies out here, so we all chose to wear fly nets to keep the flies from landing on our faces. 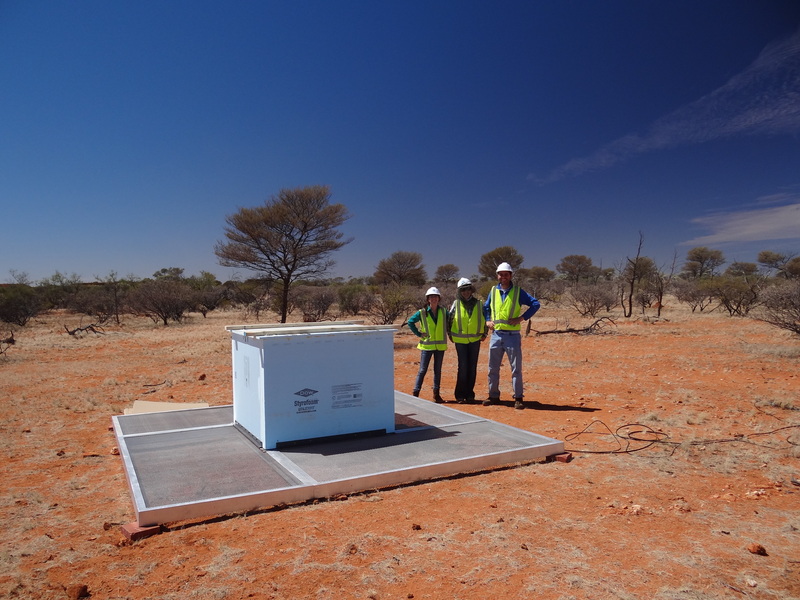 It takes about 30 minutes to drive to the site from our lodging here at Boolardy Station, which is good to keep the RFI (radio frequency interference) at a minimum. Once we got to the little hut on the site that holds the computer for the other project that Judd manages, EDGES, we started our preparation for the DARE receiver, which will also live in the little hut with EDGES. We installed a second hard drive into the computer for the EDGES experiment because it has been collecting so much data that more space was needed. Hamdi and I also added a monitor in the rack for the computer. 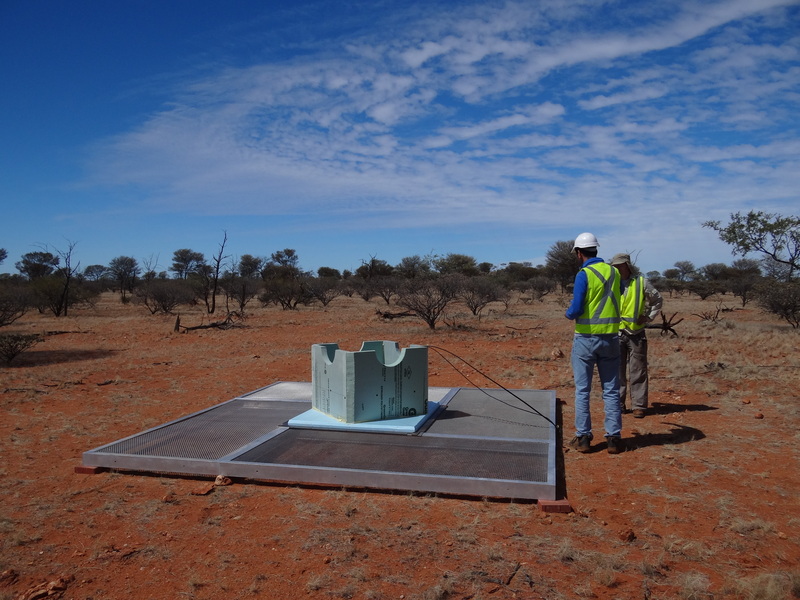 Lastly, we looked for a good location in the landscape to place the DARE antenna. 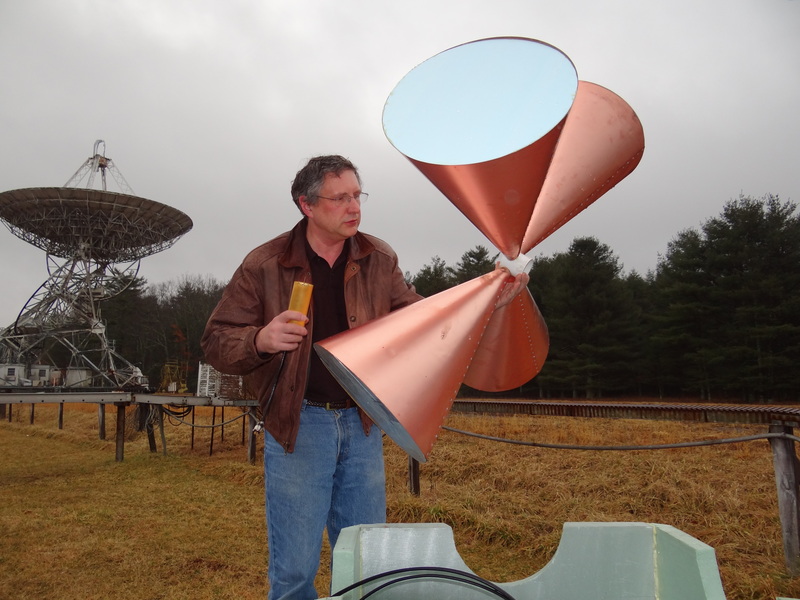 When considering a place for an antenna, you have to look out for large objects that would cause some reflection of the radio waves of the sky and of the small signal that the antenna itself emits. What this means is the radio waves would hit the tree or rock nearby and then be measured by the antenna as well as the direct radio wave from the sky. An easy way to explain this by analogy would be light reflecting off of a mirror. You can shine a light in a mirror and it will reflect at some angle (in our case a radio wave and a rock or tree). If there were a person in the vicinity, in our case the antenna, the light from the source and the reflection would both be seen. So minimizing the amount of large objects in the vicinity will mean that better and more accurate measurements will be gathered by the antenna. When we got home, we were invited by the owners of the homestead to have dinner. We had a nice relaxing evening with friends and then settled down for a much needed night of sleep! These would make much more sense to you all if you could hear Hamdi. We are working on getting some audio and video for you all to really get a sense of what we are doing out here. We started our trip March 15 by flying to L.A. for our connecting flight to Sydney. The 14 hour plane ride to Sydney served as our night of sleep (or for Hamdi, who claims to not be able to sleep on planes, “special sleep”). Our flight arrived just after 6am on the 17th in Sydney, and after we made it through customs and baggage claim, we took a train to see downtown Sydney since we had a layover of several hours. 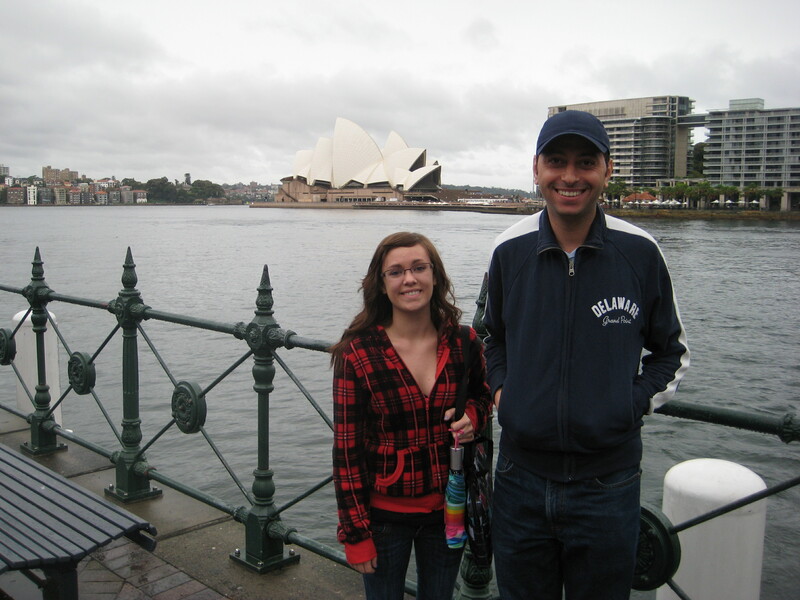 Seeing the renowned Opera House, Sydney Harbour Bridge, and the Botanical Gardens was a spectacular experience. After stretching our legs out we headed back to the airport for our last flight to Perth, which was a measly 4 1/2 hours. After shimmying all of our luggage and equipment into a cab, we made it to our hotel for the night. Bright and early this morning, which was the 18th, we set out on the long drive to Boolardy Station. 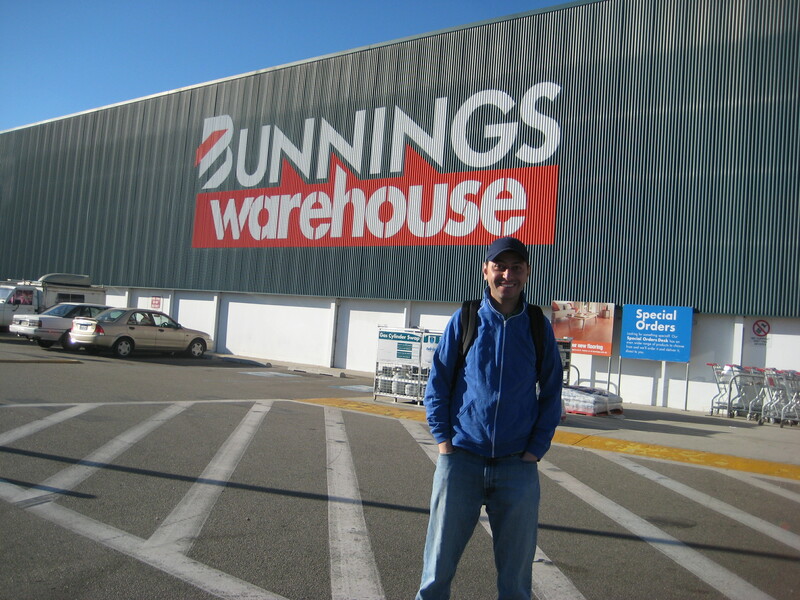 On the way, we stopped at Bunnings, which is exactly like Home Depot or Lowes, to pick up a few last supplies, and then later at a very cute bakery to grab some lunch. After 8 hours of music, laughter, and kangaroo sightings we finally made it!! Worn out and stiff, we settled into our rooms and then met up with everyone else staying out at the site for dinner in the common area. The housing here is quite the experience! 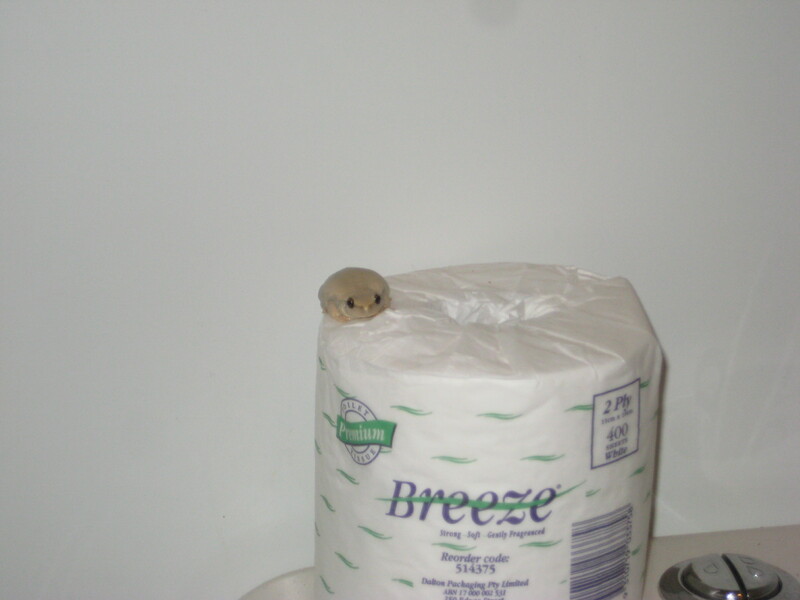 We have cute frogs that find our toilets a nice place to hang out. Apparently, Hamdi has a very special relationship with the frogs, because most of them are in his room. Besides the frogs, it is raining here which can cause issues with the dirt roads. 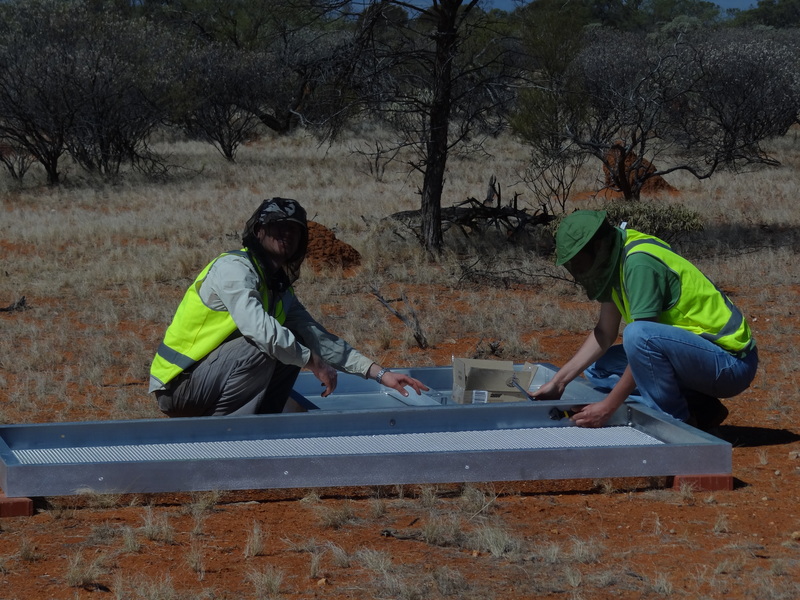 We are hoping to be able to make it out to the site tomorrow to check out another of Judd’s projects, EDGES, which is another radio telescope to measure the temperature of radio signals from the early Universe. 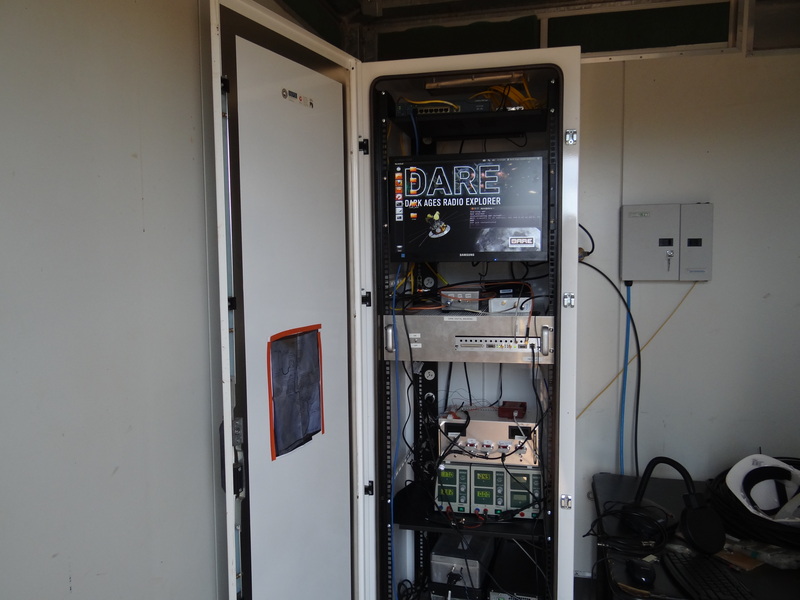 The DARE antenna and receiver will arrive at the site in another day or two. Until then, Hamdi and I will be putting the final touches on the power supply, working on EDGES, and rearranging the computer rack for the DARE receiver. There will be updates and more pictures posted every day throughout the week, so keep a look out! Only one week until we leave for Australia! Naturally this means lots of last minute preparation needs to be done. We have spent this week putting all the last touches on the machinery we have been working on. Apparently Christmas came twice this year! The lab is overflowing with new boxes of voltage regulators, connectors, metal enclosures, heat sinks, tools, screws, etc. Thus, the check list has been slowly whittling down to the last few items that need to be packed. The antenna was supposed to be shipped on Monday from Green Bank to Australia, so we were all a bit nervous when we heard that it did not get sent on its way on Monday. It turns out snowfall on the mountain roads to the observatory held up the truck, but thankfully it was shipped on Tuesday and should beat us out to the site! Hamdi finished drawing all of the holes that needed to be cut on the box that will hold the frequency generator and sent that off to get cut at the machining shop. 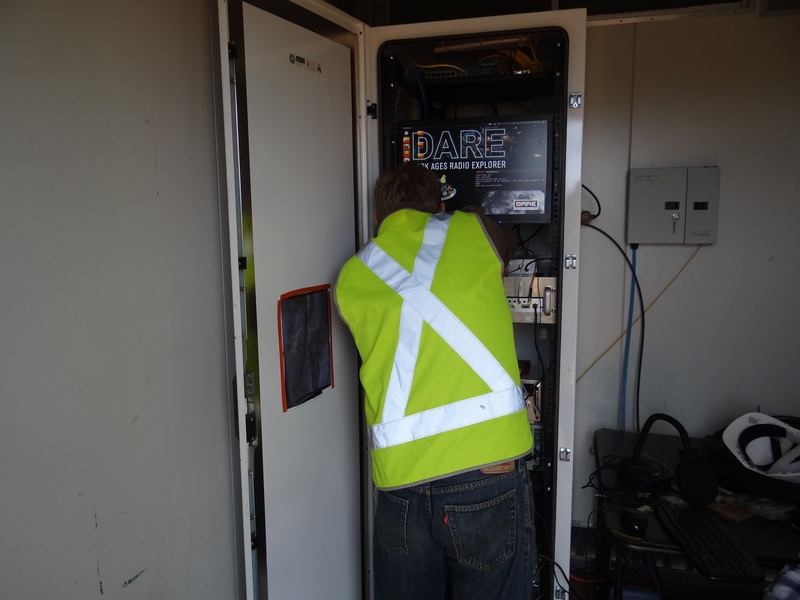 We worked all day on Monday setting up and testing the power supply that will replace the temporary one we built in West Virginia. I have been soldering up a huge cloud of smoke putting that all together while Hamdi has been watching over my shoulder when he is not working on other odds and ends getting ready to leave. Because we leave next Thursday (which we are all very excited about! ), I may have to cut the holes for the power supply box myself with a fun tool called a nibbler. The name provided me a little joy, so I thought I would share. 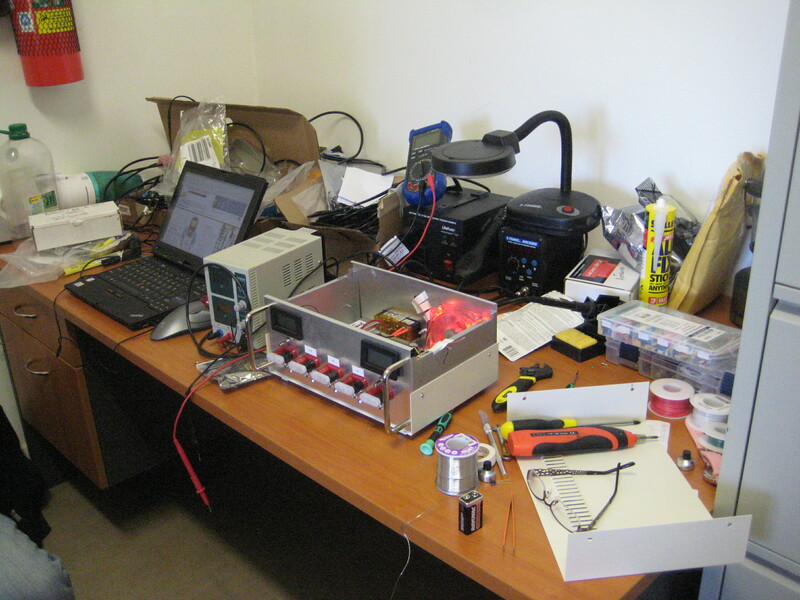 Once the power supply is done, Hamdi, Judd, and I will begin the packing processes. I will keep everyone posted on what is happening during our journey through Australia! Hello everyone! Here is a quick update on what is going on to prepare for the big trip to Australia. 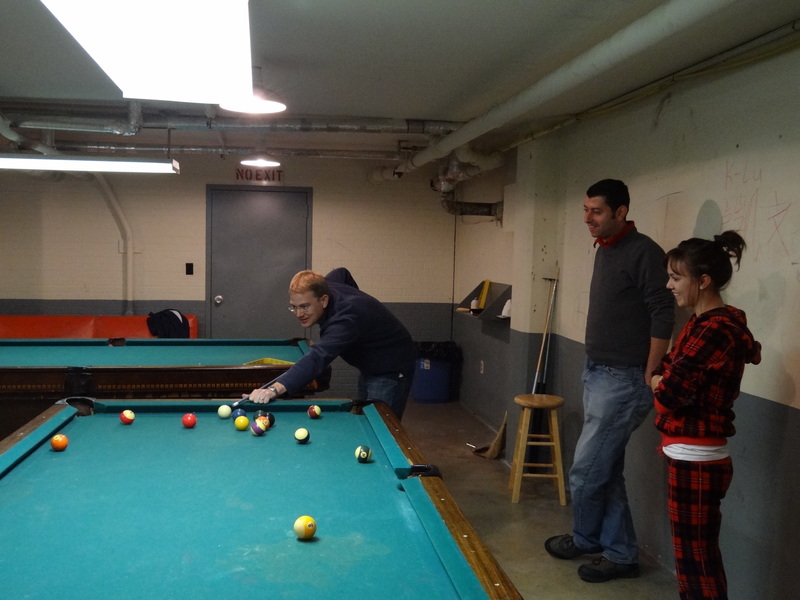 Last week Judd worked on consolidating the data that DARE has been gathering in Green Bank, West Virginia. 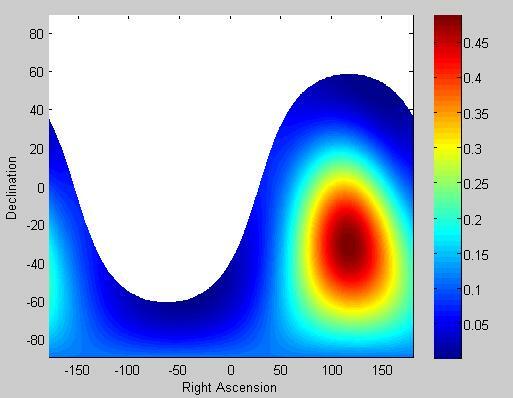 Below is a picture of the frequency plots of the sky. The vertical lines across the picture are radio frequency interference (RFI) from FM radio, TV stations, planes, local electronics, etc. 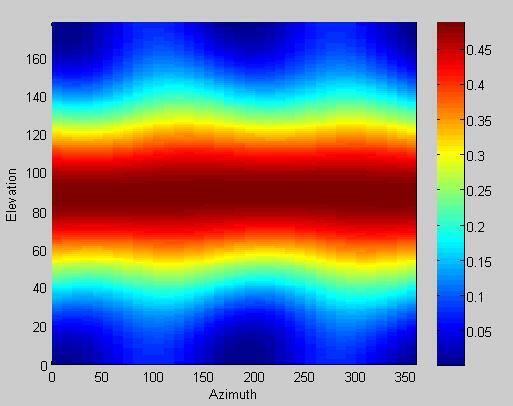 The plot shows the frequency versus the time. So as the figure goes from left to right, the frequency changes from 0 to 500 MHz. 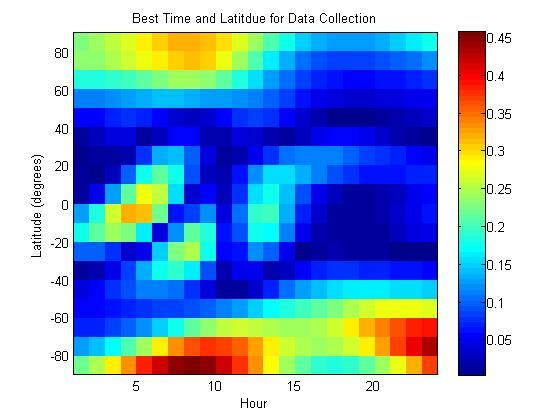 As you look at the figure from bottom to top, the time of day is changing. 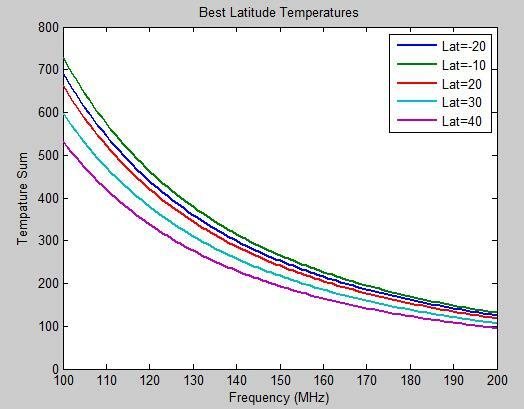 The red on the plot means that at that point in time the antenna is picking up a very strong signal and the blue means that there is a very weak signal. 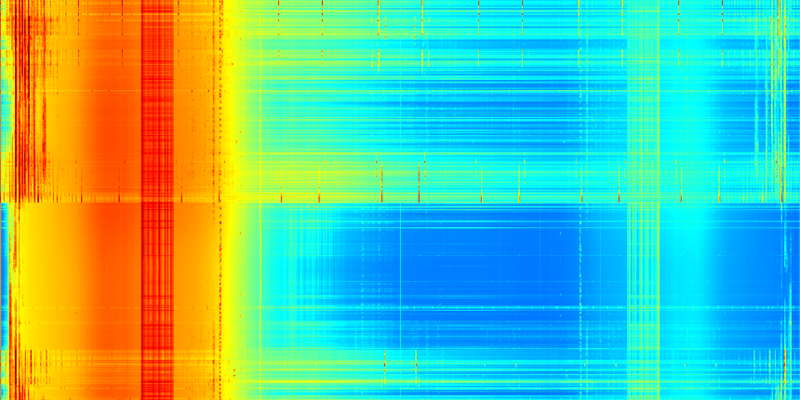 The little red band in the orange region of the plot is the FM radio band. This is just one plot of several that have been made, but all of them are very consistent. 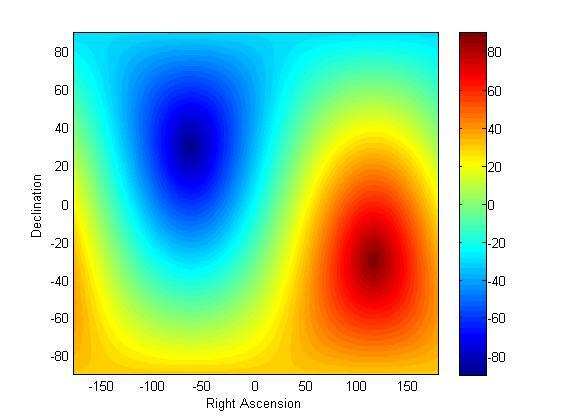 This is very reassuring, because it signifies that the antenna is gathering reliable data. 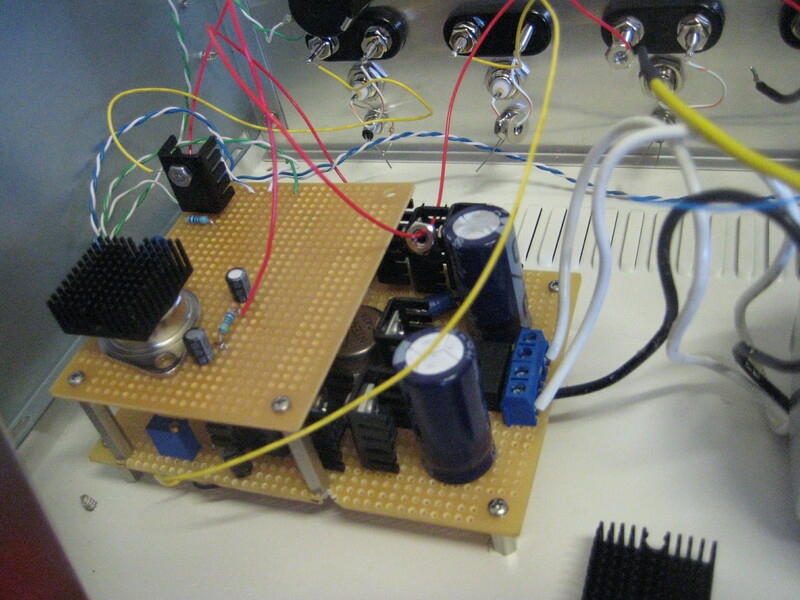 Hamdi and I have been working on creating a new power supply for the signal generator. This new power supply with be replacing the circuit we built in West Virginia. That circuit was very make shift, so this new one is more permanent for the mission that will be set in motion in Australia. This new project required a few new tools and components. 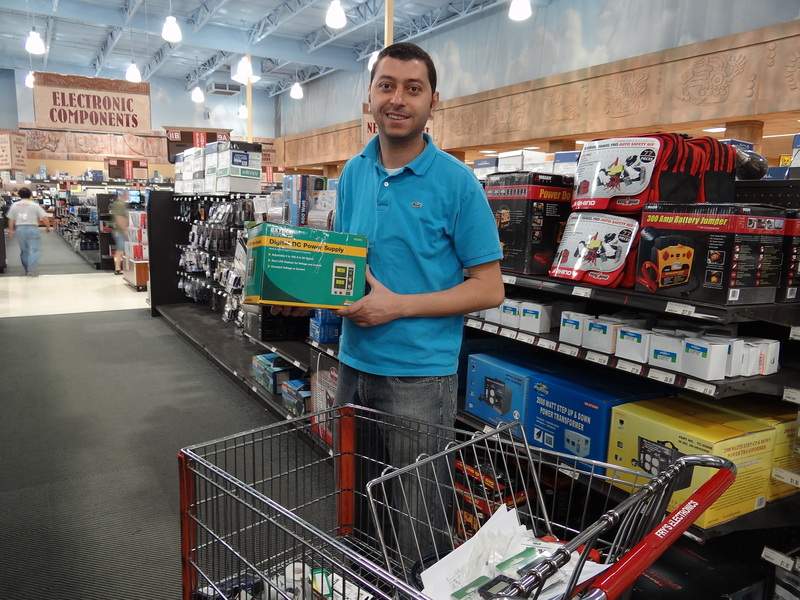 Saturday, in the beautiful Arizonan weather, we set off to the electronics mecca, Fry’s Electronics. We spent about 3 hours there going through all the different components and supplies. It was a successful trip! 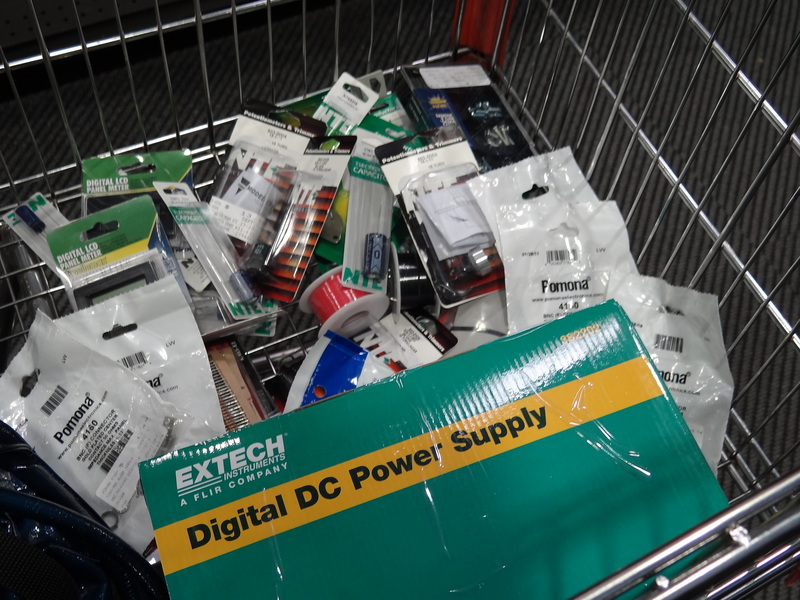 Hamdi went on to finish the shopping list of all the things needed for the trip to Australia at a few other electronics stores. We have three more weeks to finish everything! I will keep you posted on all the advances we make to reach our goal of leaving the DARE antenna all set up collecting data in the Outback. 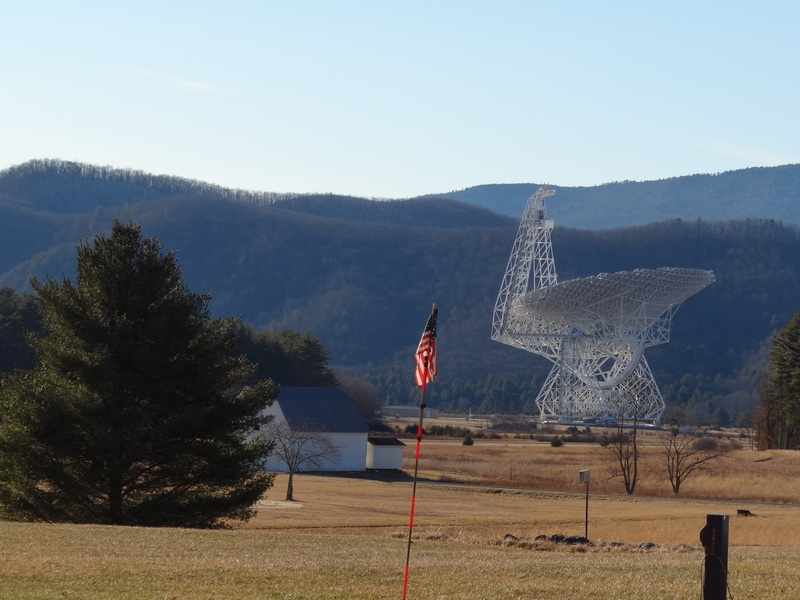 Last week the team was at the National Radio Astronomy Observatory in Green Bank, West Virginia doing all of the initial set up and testing of the freshly built antenna for the mission DARE. Over the course of the week, I provided little snippets of our progress. In the midst of the hustle and bustle to get back to Arizona for a new week of classes, I missed out on giving the full overview of all the week’s work. On Friday morning, we had finished all the set up and solved all the problems. The last thing to do was put everything together and see if all our hard work paid off. 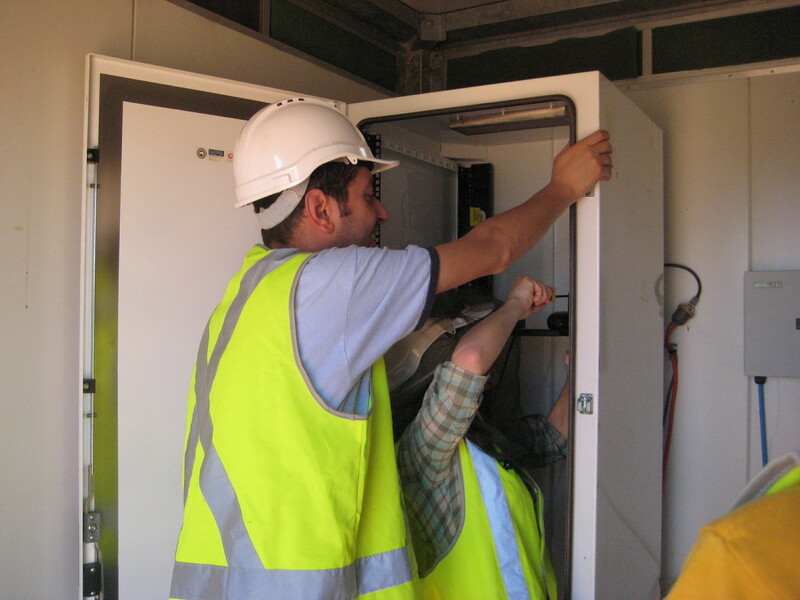 Once everything was hooked up, there was a pause before we turned the whole system on – and to everyone’s great joy, everything was “up and running” as Hamdi would put it. We drove back to the cafeteria for our last lunch at the NRAO, and then Hamdi, Judd, and Abhi went hard at work to finish the last bit of code. Once this was done, we just left the system running, and it has been collecting data ever since. This week we are hoping to begin analyzing the data to see if it matches up with what we predicted it would. In only four short weeks the same team, except for Abhi , who will be hard at work in Boulder, Colorado, will be traveling to Australia. 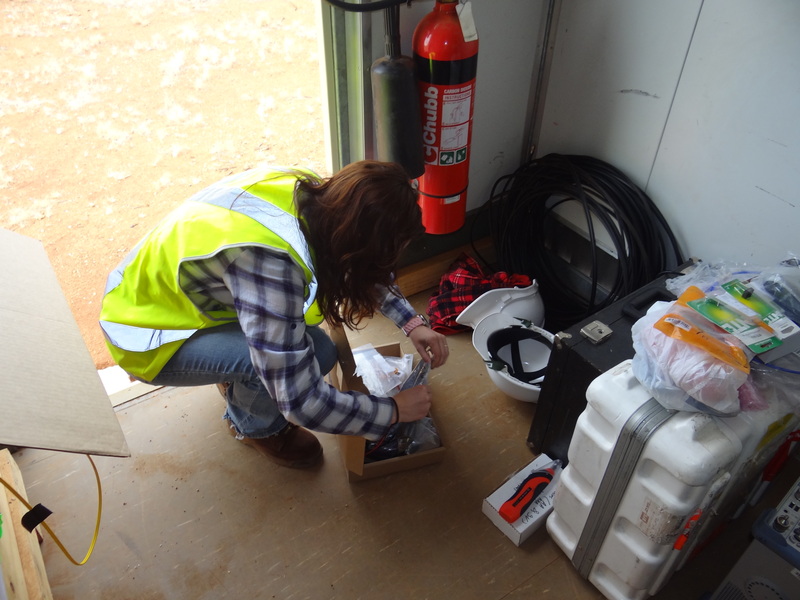 All of the equipment that we set up in West Virginia will be shipped to Australia for further, and hopefully better, data collection. The reason we are hoping for better data in Australia is because there is less RFI (Radio Frequency Interference). Until this trip, we will just be preparing all of the additional equipment and perfecting all the data analysis code. Hope to have more to update to you all soon! 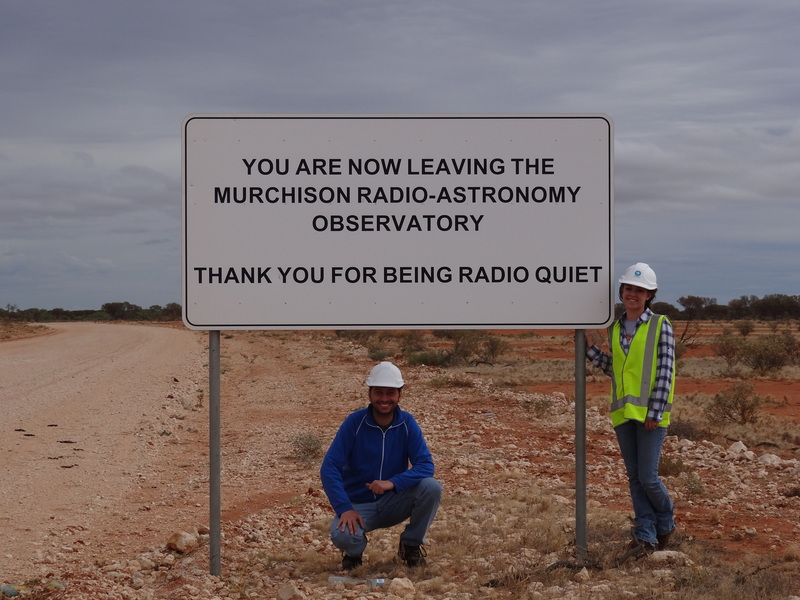 After we finished all of our work for last night, we adjourned to the basement of our residence here at The National Radio Astronomy Observatory for some relaxation. 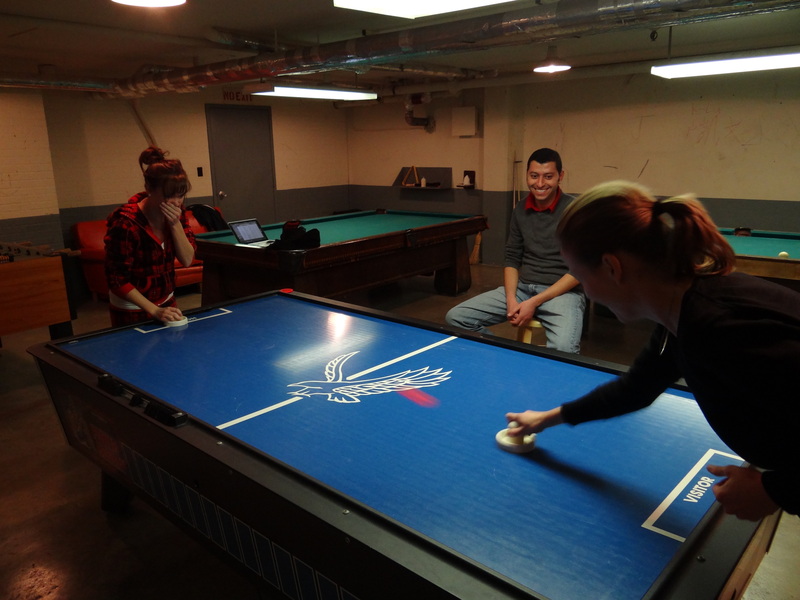 We found there a pool table, air hockey table, foosball table, and a ping pong table.There are some fun pictures of the students versus the degree holders in pool and the air hockey mini tournament. Cassie deserves a special notice for being the only one who beat me. I feel like the rematch may happen before we leave! Today began at the spritely hour of 9am in the, what we would call the heavy rain and the West Virginians would call a light sprinkle. 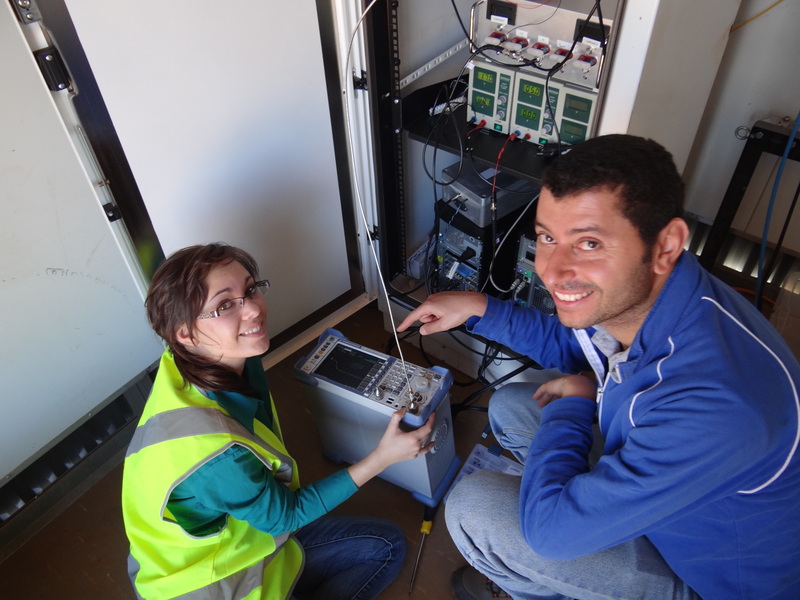 We drove down to the site and began switching over to the new power supplies and computer. Abhi and Judd worked on running the new code that controls the switching form the calibration load to the antenna. 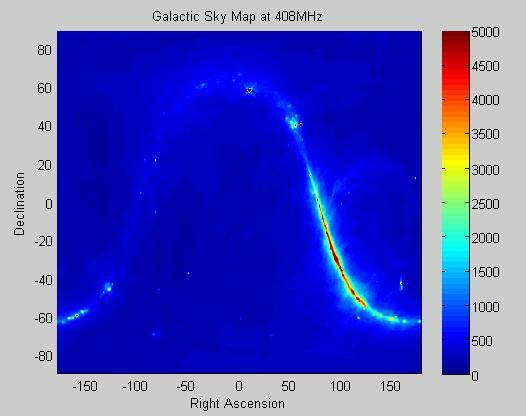 What this means is we need something to compare the data we get from the antenna to because we do not know the magnitude of the signal from the sky. By having this known load calibration we can figure out information about the energy received from the universe. 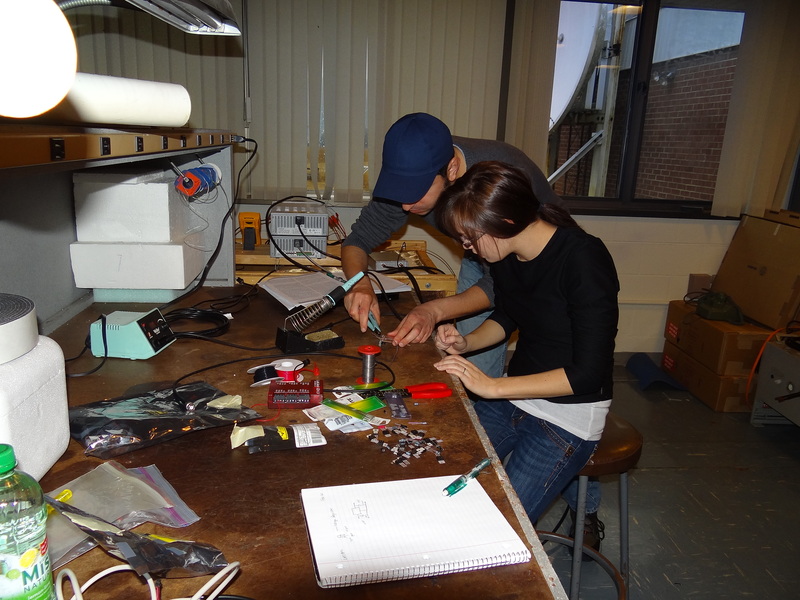 While Judd and Abhi were polishing that code, Hamdi and I embarked on my first soldering experience! The small circuit we built was to solve the issue I mentioned yesterday about the need for three different voltages and only having 2 power supplies. Needless to say, it will take a few trials to make it work the way we would like, which will be my task for tomorrow. Once this circuit is working, we will connect it to the whole system before leaving West Virginia. After lunch we were joined by Dr. Rich Bradley (NRAO/UVA) the main builder of the antenna and balun, which holds the temperature sensor. We trudged out in the rain to open the styrofoam box that holds the antenna. Once we removed the balun, the temperature sensor was replaced and it now works beautifully! Upon returning the balun into the antenna for a full system test, we noticed that some of the connections needed to be reinforced. We added some super glue to these joints and then put the system back together. I find it very interesting that most people say that all things can be fixed with duct tape. Well the engineers are not much better; when something breaks, we just use some super glue and everything gets fixed. Today, although very long and full of hard work, ended in a moment of success, DARE has taken its first big step to becoming the satellite that it is destined to be!